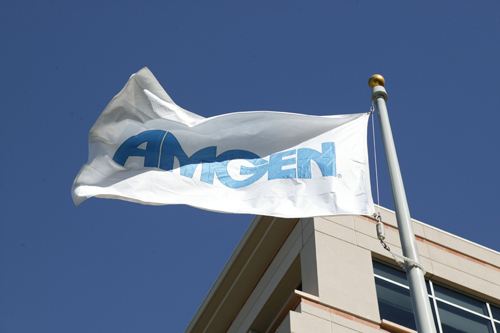 Amgen is on track to launch a biosimilar competitor to AbbVie's Humira - the biggest-selling pharmaceutical product in the world - after positive data in a phase III trial. The biotech major said that in the first of two late-stage studies, its ABP 501 biosimilar was equivalent to Humira (adalimumab) in terms of its efficacy and safety in patients with moderate-to-severe plaque psoriasis after 16 weeks' treatment. The drug also matched its rival in terms of its tendency to stimulate an immune response in the patient, which can reduce the effectiveness of antibody treatments. If the results of the second phase III trial echo the first, Amgen could be in a position to compete directly with Humira when it loses patent protection, due in 2016 in the US and 2018 in Europe. Other companies such as Boehringer Ingelheim, Novartis unit Sandoz and Coherus are also developing biosimilars of Humira. However, Amgen's biologics expertise and marketing muscle are expected to make it a potent competitor in the marketplace and allow it to grab market share from AbbVie's drug, which racked up a massive $11.5bn in sales last year, according to PMLiVE's Top 50 pharma products list. For AbbVie competition will be a very big deal, as Humira accounts for 60% of its revenues, although because biosimilars are typically priced at a 20%-30% discount to the originator drug they do not generally cause the dramatic reduction in brand sales that occur with generics of small-molecule drugs. The pharma company is banking on pipeline projects - such as its new combination therapy for hepatitis C - to offset the start of competition to its top product and has also agreed a $55bn deal to acquire rare disease specialist Shire to bolster its portfolio. The ABP 501 data "further demonstrates [Amgen's] commitment to provide patients with access to high-quality medicines," commented Sean Harper, the biotech's R&D head. "We look forward to continuing to leverage our experience and expertise in biotechnology to bring biosimilars to patients," he added. Amgen has set up a big programme in biosimilars, with six drugs in development and the first due to reach the market in 2017, although it is already facing biosimilar competition to its own drugs such as Neupogen (filgrastim) and Epogen (epoetin alfa) in Europe. The other biosimilars in its pipeline are thought to include versions of Roche's Avastin (bevacizumab) and Herceptin (trastuzumab), Roche/Biogen Idec's MabThera/Rituxan (rituximab), Johnson & Johnson's Remicade (infliximab), and Bristol-Myers Squibb/Eli Lilly's Erbitux (cetuximab). All told, the global biosimilars market is expected to grow to around $25bn by the end of the decade as drugs with sales of around $100bn lose patent protection, according to a recent report from Thomson Reuters. Webinar: What next for biosimilars?